Think baking with yeast takes forever? Think again! This whole wheat focaccia bread is ready in a half hour! I can’t believe I haven’t shared this recipe with you guys yet. 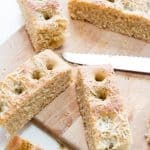 I’ve been making this hearty, crazy easy, whole wheat focaccia bread for years and years and years. It’s a staple in our house because it comes together so darn quickly! 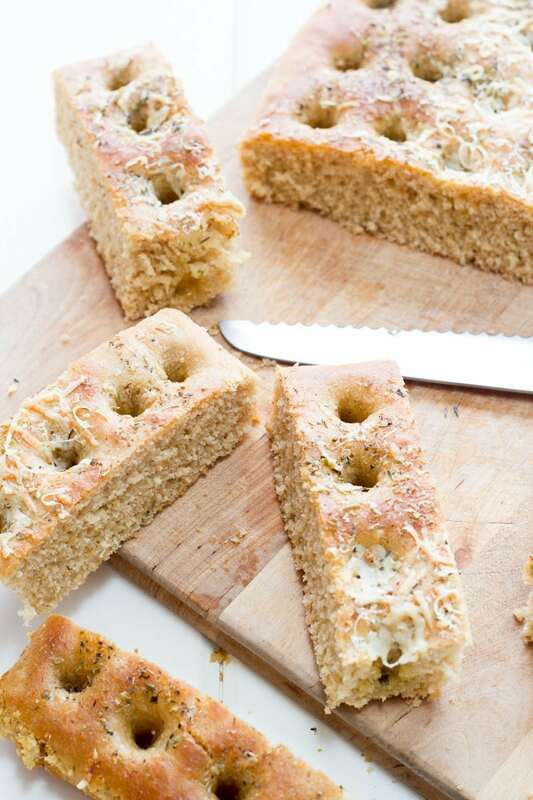 If you think all yeast breads must take forever, then this focaccia is here to prove you wrong. It’s ready start-to-finish in a half hour. Making it a bread that is quick enough to bake to go along with even the quickest of weeknight meals. This original recipes comes from my sister, and I believe she got it from a magazine (I actually think this recipe from Fleischmann’s Yeast may be the original). But like everything in my kitchen, I’ve tweaked and adjusted it to make to something all mine own. I wanted something that was 100% whole grain, used a touch less oil, and really packed in the garlic-herb flavor. Oh, and something that came together quicker! The original directions call for 45 minutes of rising time. Pssssh, ain’t nobody got time for that. I figured out pretty quickly that you could get by with much less rising time, and still get an incredibly delicious bread. Yes, you could let it rise longer and get a taller, fluffier bread, but I think the short rise time is perfect for busy folks—and it’s still super yummy! The key to getting whole wheat focaccia bread that doesn’t taste like cardboard is all in the flour you choose. Poke around the baking aisle of your grocery store and you’ll probably find something called white whole wheat flour (we actually order ours online). It’s still 100% whole grain, but it’s ground from a different variety of wheat berries that are much milder in flavor and texture. It’s a bit more pricey, but I think the flavor difference is worth the few extra bucks. If you can’t track down white whole wheat flour, you can try using regular whole wheat flour in the amount listed, but the end result will be much heartier. My recommendation is to use half all-purpose flour and half whole wheat in place of the white whole wheat flour. This recipe makes a decent amount of bread (about eight servings), so feel free to stash the extras in the freezer. Once the bread has cooled and is sliced, store it in a ziptop freezer bag, and then just defrost pieces as you need them. Or, you could leave the bread unsliced, and cut as you need it. This stuff makes for crazy good sandwich bread! Spray a 13 x 9 baking pan, set aside. In the basin of a mixer fitted with a dough hook or a large mixing bowl, combine the warm water, yeast, honey, and two tablespoons of olive oil. Stir or mix until just combined. Let bloom for 1-2 minutes, or until a little foamy. Add in the flour, salt, and minced garlic. Mix until it forms a sticky dough. If using a mixer, knead on low using the dough hook for 3-4 minutes, or until it starts to lose some of its stickiness. If mixing by hand, dump onto a floured surface and knead for 5-7 minutes. 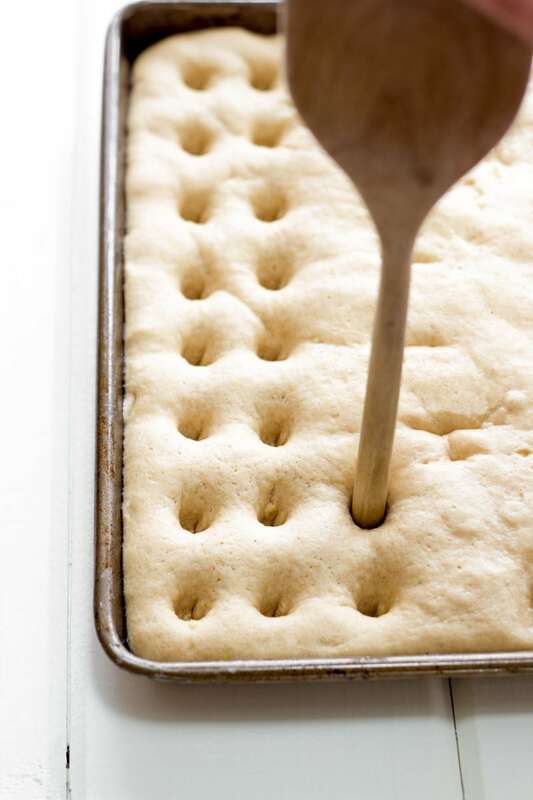 Spread the dough in an even layer in the prepared baking pan. Cover with plastic wrap, and let rise in a warm place (I like in the oven under the oven light or on a heating pad) for 10-15 minutes, or until noticeably puffy. Once the dough is risen, preheat the oven to 375° (make sure to remove your dough first if you’re rising under the oven light!). Remove the plastic wrap, and using the end of a wooden spoon, press indentations in the dough every 1-2 inches. Drizzle over the remaining olive oil, and sprinkle on Italian seasoning and cheese. Bake in preheated oven for 10-12 minutes, or until the top is just golden brown. Remove from pan, and slice into 16 even pieces. The speed of this bread is due to the quick rising in a warm place. I like using the oven light or a heating pad. If you don’t have a warm place, no problem, just let it rise more slowly on your kitchen counter. To get a light and fluffy bread, while still keeping in 100% whole grain, use white whole wheat flour. have you tried using dinkel/spelt flour? We use it for almost everything, but it has a softer crumb than normal flour I think. This looks delicious so we’ll try it later this week! 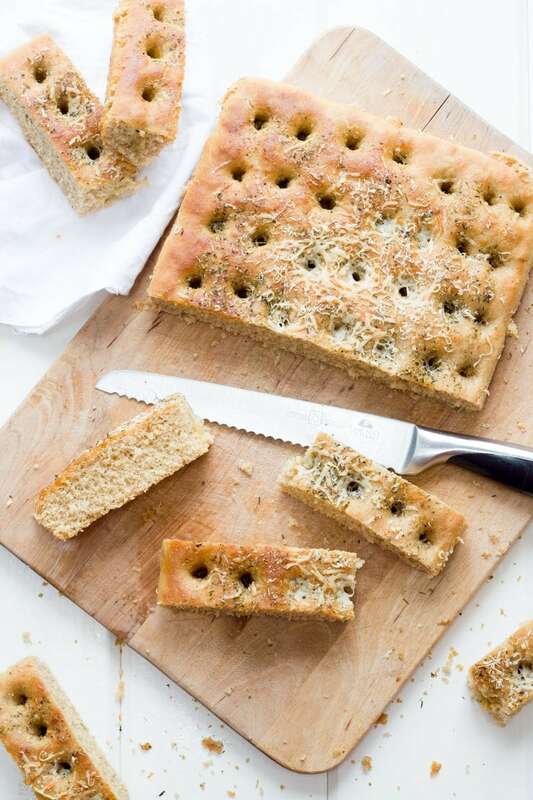 Focaccia bread is my favorite bread for dipping in a mix of olive oil and balsamic vinegar. I soaks up just the right amount of oil and vinegar without falling apart. I’m definitely going to have to try this recipe. Made this immediately for dinner tonight. And it’s SO good! Cannot WAIT to make this this week! This looks fab. Even faster than the one I make. And all wholemeal too. Can’t wait to give it a try…thanks! Woah. 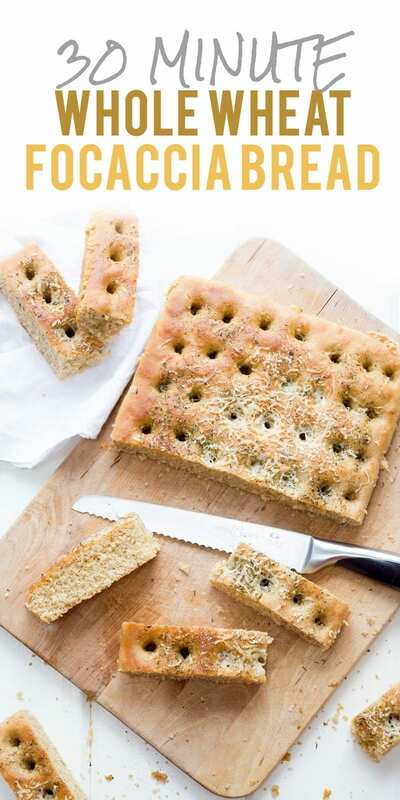 You had me at 30 minute focaccia! This is a must try. Just made this tonight and it’s awesome! Totally going into my usual rotation. Thanks for sharing! What if I don’t have active yeast? Mine looked more like flat bread. Although it tasted great, I think I was one cup of flour short. I have a question about the carbs. I used a calorie calculator to see how many carbs are in 3.5 cups of wheat flour. i then divided by 8, as per your serving suggestion. The result I ended up with was roughly 75g of carbs per serving (25%. of DV based on 2k calories). Does this sound right? It’s just the flour, none of the other ingredients. Sounds about right! Flour is almost entirely carb-based. If you’re counting carbs, flour and bread products aren’t, typically, your friend. I wouldn’t say we’re “counting carbs”, but we’re trying to eat healthier. 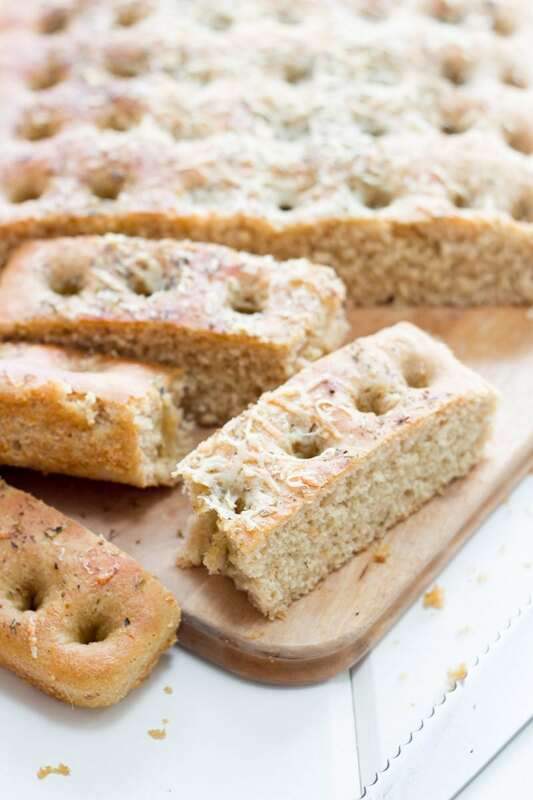 We’ve recently discovered how good Focaccia bread is, and were hoping for a healthier alternative. Any suggestions on droping the carbs in the recipe? Before I start, I heat my oven to 50°C and switch it off. Always heat my yeast coughs like that in the winter. Good stuff…… used a bit of dried sage as I was out of anything resembling Italian herbage. And…..this is hubby approved….. he had no clue it was whole wheat! Bahahahahahaha! Thanks for the great recipe! Thank you for sharing this recipe, I did it and it turned very nice, soft and tasty, the only detail is that it took more time to rise but the result was worthy, regards from Venezuela! Julie, I just loved your recipe. More interestingly the pictures are just too good. Cheers!! This is actually Cassie’s recipe, but I’ll pass on the compliments!